Enjoy a gargantuan amount of laptop storage with this Toshiba MK4058GSX 2.5-inch Hard Drive! With up to 400 GB of storage, you’ll be able to download and save all the applications, music, videos, games you want. It features an efficient SATA/300 interface, a 5400 RPM rotational speed and an 8 MB buffer for delivering top-notch performance. And even while it’s toiling away, it’ll keep quiet thanks to Toshiba’s Super Quiet Seek Technology. 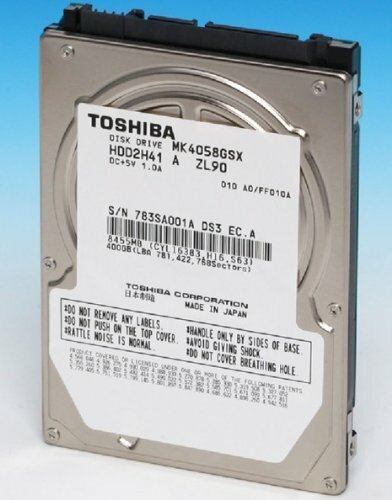 Upgrade your notebook computer’s storage capacity with this eco-friendly Toshiba MK4058GSX 2.5-inch Hard Drive today!